This stylish, breathable sport jacket has been designed for performance. It features a two way zipper at the front and has a hidden back gusset with a waterproof skirt, which allows the rider to adjust the fit while in the saddle. Adjustable cuff gusset accommodates gloves and prevents hay and weather elements from going up sleeves. As you all know we were at BETA last month showing off our clothing range. During one demonstration we highlighted the features of the All Weather Rider Jacket. We thought that some of these pictures may help to show the functions of the jacket…Please let us know what you think. Asmar offers customers free shipping within North America for the month of December. There’s still time to get your show wear by the festive season. Please bookmark Asmar Equestrian’s social pages and share with your friends! We are delighted to share with you the details of our social media hubs and look forward to connecting with new friends online – please bookmark these pages today, and come along to Facebook to follow us; we are currently running a competition with EquestrianLife.com to win an amazing Asmar All Weather Rider Jacket. “Just received my “All Weather Rider”; the quality is top notch and the design is so unique” says customer Anne Kralman of the product. Many thanks; the Asmar Equestrian team. 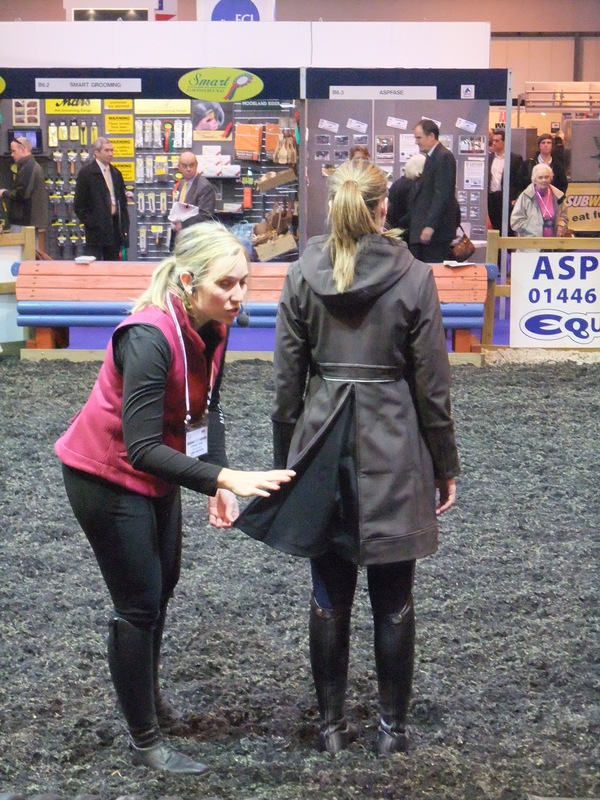 Asmar Equestrian returned from the annual British Equestrian Trade Association’s International Exhibition with the Award for the Most Innovative Rider Clothing of the Year 2011. Asmar won for its All Weather Rider™ jacket judged to be an “elegant, multi-functionalgarment, well tailored to allow plenty of movement and flexibility”. 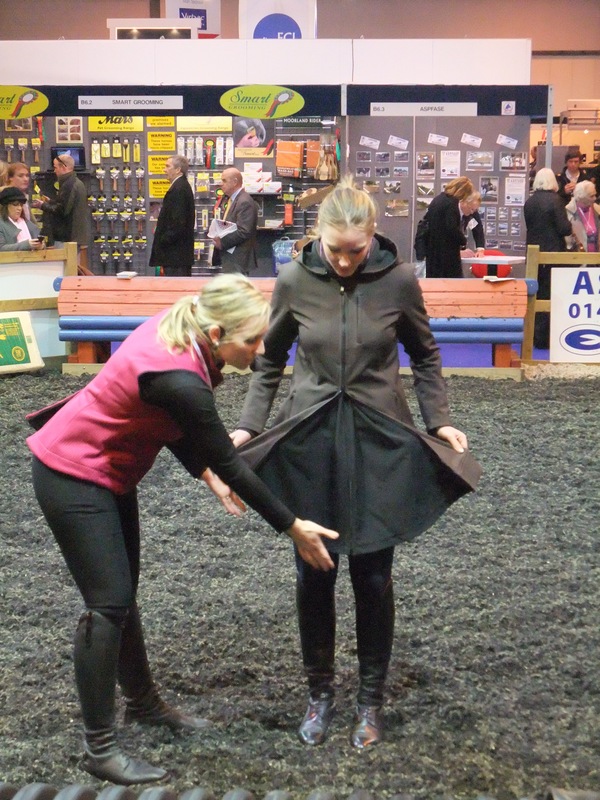 The patent pending coat transforms to cover riders and most saddles from the weather. A hidden zipper gusset at the center back and front unveils awaterproof skirt to extend over the saddle. Zippers at the cuffs with a builtin cuff prevent hay and rain from entering the sleeve. The fabric is bondedwith a lightweight fleece backing for warmth without bulk. 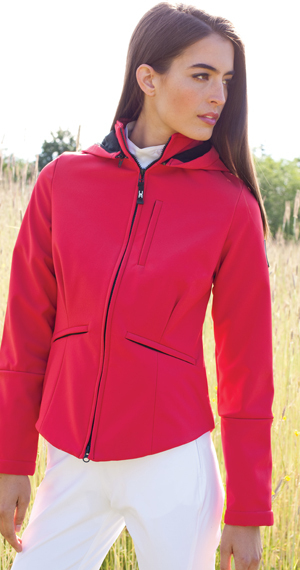 The fabric iswaterproof, windproof and stretches in all directions. The All Weather Riderjacket is designed for riders who want to ride in virtually any weather. In accepting the award, Noel Asmar, CEO, rider and designer, expressed gratitude not only to BETA but the scores of retailers who have ordered the line of rider specific clothing designed to perform with the use of sophisticated technical fabrics that stretch to enhance the comfort and practicality of the collection. Asmar Equestrian outerwear debuted in North America at AETA in January and in Europe at BETA in February, featuring a rich color palette and styles with a play on tradition highlighted by elongated silhouettes for a flattering, ageless style in and out of the ring. Noel Asmar has been designing for some of the world’s best known lifestyle brands for over a decade. Inspired by her own love for the equestrian lifestyle, Asmar focuses on creating distinguished apparel with technical savvy and details that clearly define the brand.